baby Ridley bump. 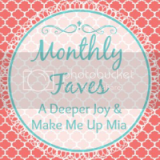 : Monthly Favorites! Another month from the calendar! Getting really close to fall & really close to pulling out all of those sweaters, leggings, and boots from the remainder of the year. This thing is so amazing, and for $10 that makes it even better. I've been putting frozen strawberries, lemons, and mixed berries in it so far & it's been wonderful. Love the little bit of flavor it adds to the water without being too overwhelming. I probably refill this thing 5+ times a day. Loving it! I will probably have this on my list of September monthly favorites because I know I will get so much use out of it once the temps start to cool down. I can totally picture it over a v-neck tee, a pair of leggings, and a pair of cute boots. Perfectly comfy for work too! I got this in my August Ipsy bag and it's probably my favorite item from the month. It goes on so well & I love the purple color. I have several plum colored Bare Minerals and Simply Beautiful eye liners, it's probably my favorite color of eye liner to wear with a really light, shimmery white or lavender colored eye shadow. Four. Baby Johanna was born! I need one of those water bottles! I keep seeing those water bottles every where! I have a water bottle obsession so I think I need one! :) And I love that UD eyeliner! So perfect! Yay on your house construction! Can't wait to see the finished product! SO exciting with your house having so much completed thus far. We built our house about two years ago and it's been the best decision ever! Your house and the baby are so exciting! Also I love my infuser water bottle. I can't wait to get my ipsy bag this month!! Great idea on the water too! Wow! That is progress on your house! Looks awesome. And those infused water bottles look amazing! holy moly, the house is crazy! so much progress. that liner looks amazing, need to try it. You and that baby!!! What a beautiful picture! Can't wait until you are holding your own!! Love seeing all the house progress! And I'm fairly certain I need one of those water bottles! that is my fave eyeliner...seriously LOVE it! I got one of those water bottles as a giveaway at a conference and I am obsessed with it, love it!